Don't expect Feynman-style anecdotes - although the writing is conversational, the style is fairly dry. However, the topics covered give insights into everything from the nature of writing in scientific papers and the interpretation of quantum entanglement, to a physics view of consciousness and that ever-ephemeral concept of 'elegance' in science. Collections of essays don't always work well as books, but Mermin's thoughtful and occasionally funny ponderings make ideal bite-sized reading, working brilliantly when you don't have time to sit down and read for an hour or two at a go. To illustrate the pros and cons of the approach for different readers, I'll expand a bit on the first of the essays, published in 1988, entitled 'What's wrong with this Lagrangean.' (Why no question mark in the title?) In essence this is a long riff on the oddity that the journal Physics Review Letters spent two years spelling the word 'Lagrangian' wrong, and no one noticed. Of itself, the spelling error is relatively unimportant - it doesn't change the meaning and given the mathematical structure is named after someone called Lagrange, it isn't even odd. But what Mermin does is to extend the basic error into an investigation of the difficulties posed for anyone to keep on top or even bother to read journals when there were so many, expanding in size and number all the time. This wasn't helped by the habit at the time was to send round preprints before the journal came out. And then there's the load on the library budget - should they subscribe to each journal or be selective? Like many of the early essays, what we read is also fascinating because it portrays a very different academic world. Mermin (my spellchecker wants to call him Merlin) appends a postscript to each essay, and notes just how much, for example, the internet has changed things - not just in disposing of the idea of preprints, but in terms of the way papers are accessed and collated. He also notes in the postscript to his follow-up second essay, 'What's wrong with this library' (still no question mark) that 'Online journals have led to a phenomenon that had not occurred to me in 1988: the disappearance of the library,' noting that the Cornell Physical Sciences Library was closed and converted into a study hall in 2009. These postscripts are essential to the effective nature of the essays, allowing them to provide a commentary on the changing nature of science and science communication between professionals as much as they are about the science itself. I could go on and on about the topics I found interesting, even though you might not necessarily expect them to be. There was, for instance, a really insightful piece on how equations should be presented in papers to make sure that they were part of the written communication, rather than plonked in to reside in splendid isolation, with a range of suggestions to make their use more effective. Even the title of the book is worthy of comment. 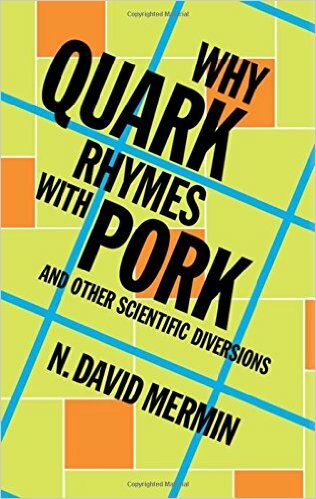 When someone pointed out the title recently, they got a host of comments explaining that quark can't rhyme with pork, because the particle was named in response to a James Joyce quote that clearly rhymes the world with 'Mark'. However, what the critics failed to realise, but Mermin does, is that the word's origins are more complex than the complainers thought. (In fact he ignores the real reason, but has fun with the language.) My only personal criticism of the title, which may be a UK/US thing, is that I think quark rhymes with fork, not pork - in English English the 'or' in the two words is pronounced quite differently. There's only one thing extra I'd really have liked to have seen in the book, which was to have some explanatory footnotes added, which would have enabled Mermin to reach a wider audience than the book probably does at the moment. Given the vehicle he was writing for, Mermin inevitably assumes he can take for granted that we know, for instance, what a Lagrangian is - a couple of lines in a footnote would not have inconvenienced physicists, but would have made the book more accessible to non-scientists, both academics and mainstream readers. Another example in the second essay is where Mermin asks 'Why do so many particle theorists publish [in a commercial journal] rather than in Physical Review D? You guessed it: no page charges.' Unless you are an academic, a footnote on page charges would have been a useful touch of context to understand the complaint. This, then, is a treasury for anyone who has an interest in how academic science, and specifically physics, is undertaken. Although it isn't a light set of fun essays (as the title perhaps misleadingly suggests), it is full of thoughtful and thought-provoking material, as well as documenting changes in the way that science is professionally communicated. I can't remember ever before reading a set of academic essays and doing that 'I'll just read one more' thing where you can't put the book down. But it happened to me with this one.